Free Shipping Included! Springfree Trampoline - 11ft Large Square Trampoline With Basketball Hoop and Ladder by Springfree Trampoline at Scruffs Game. MPN: S113. Hurry! Limited time offer. Offer valid only while supplies last. Our large square trampoline has a soft bounce and plenty of jumping space. Designed for large yards and children (and adults!) of all ages. Our large square trampoline has a soft bounce and plenty of jumping space. Designed for large yards and children (and adults!) of all ages. Springfree Trampoline's patented design eliminates 90 per cent of all product-related trampoline injuries. 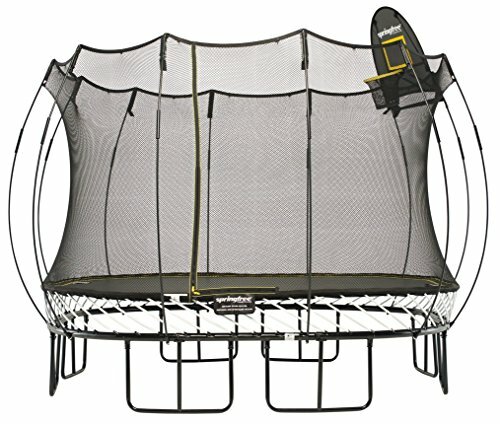 On a Springfree Trampoline there are no dangerous springs to hit, the frame is beneath the jumping surface and out of harm's way and the flexible enclosure keeps you safely on the trampoline. If you have any questions about this product by Springfree Trampoline, contact us by completing and submitting the form below. If you are looking for a specif part number, please include it with your message.